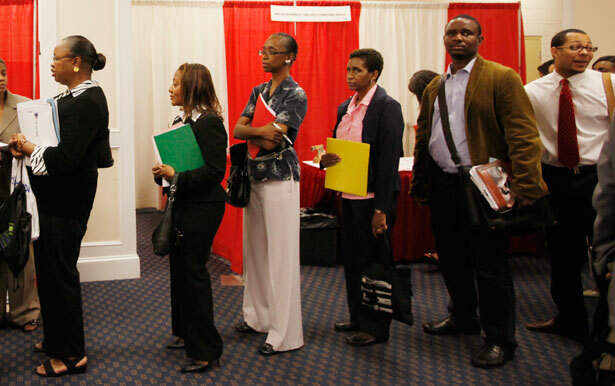 With a 7.6 percent unemployment rate, and much higher youth unemployment, job creation must remain on the agenda. The United States still has an official unemployment rate of 7.6 percent. But the real unemployment rate—if people who are underemployed and people who have given up on the search for work are included—is roughly double that. And for some groups of Americans, the numbers are dramatically higher: African Americans aged 16 to 24 experienced an unemployment rate of 28.2 percent in May. Latinos in that same age group had an unemployment rate of 16.6 percent. In general, young people are having a hard time finding jobs, and that is especially true in urban centers that have been hard hit by long-term deindustrialization that’s linked not just to an absent industrial policy but also to wrongheaded “free-trade” agreements such as NAFTA and the extension of permanent most-favored-nation trading status to China. These are crisis numbers. The research that in the 1970s formed the basis for the Full Employment and Balanced Growth Act—the Humphrey-Hawkins Full Employment Act—argued that, to maintain a sound economy and society, unemployment rates should not go above 3 percent for persons aged 20 and over, or above 4 percent for persons aged 16 or over. The United States is nowhere near that goal. And this means that the jobs crisis should be a front-and-center concern of official Washington. There is no need to neglect vital debates about voting rights, marriage equality, immigration reform, Syria, Egypt and a host of other pressing concerns. But it is vital that members of Congress pay serious attention to the jobs crisis that is so real and so overwhelming for so many young Americans. This is a point that US Senator Bernie Sanders made after corporations started cutting deals with regard to visa and travel programs that were advantageous to them, as part of the wrangling over the immigration reform legislation. Sanders, a steady supporter of immigrant rights, wanted to assure that attention was also paid to the needs of unemployed youth in the United States. He did so by getting Senate leaders to agree to add a provision to the immigration reform legislation that would provide $1.5 billion over two years for states and local communities to help find jobs for more than 400,000 jobs for 16- to 24-year-old. It is possible to do more. Congress has to deal with a wide range of issues. It should never be an either/or circumstance. The calculus when it comes to job creation should be and/and. The federal government has tremendous resources and tremendous capacity to stimulate job growth. And it ought to focus especially on the communities and regions where deindustrialization and the Bush-Cheney financial meltdown have created unemployment levels that are too high—especially for young Americans. While many Americans are struggling to find work, those with jobs are struggling for better wages and working conditions—yesterday, BART workers in San Francisco went on strike after contract negotiations stalled.